Thank you very much to bloggedartistry for my 4th blogger’s award! A little sunshine to brighten my weekend! Display the award on your blog. DONE. Announce your win with a post and thank the blogger(s) who awarded you. DONE. 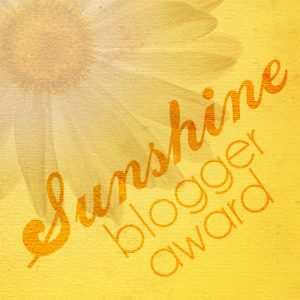 Present 10 deserving bloggers with the award – “who positively and creatively inspire others in the blogosphere.” DONE. Link your awardees in the post and let them know of their being awarded. DONE. Write 10 interesting things about you. DONE. The first day of winter is my least and most favorite day. The first day of summer is my most and least favorite day. I’m becoming a controlled hypochondriac. Even with my attention deficit, I could sit and watch the ocean for hours. I’m becoming obsessed with cute little piglets. I’ve been reading Someone Knows My Name by Lawrence Hill (aka The Book of Negroes in Canada) for 3 years on and off. I’m an extremely organized scatterbrain so my organization masks my scatterbrain-ness well. My husband makes me laugh at weird things. Have a Sunshine-y day! And thanks again bloggedartistry! Congrats again! Gotta say I’ve always been a dog owner. Not crazy about cats but that’s mostly because I’m allergic to them. I consider it now my life’s mission to change your mind on cats! Hahaha! You can try but I just don’t trust ’em! Thank you for the nomination and congrats on your own award!! And I think we all have a little Season Affective Disorder this year. I don’t think winter is ever going to end!! Aayyyyyyyeeeeeeeeeeeee! You said it! Winter needs to end! Congratulations on your Sunshine Award!! I appreciate being nominated…I already have this award though but thank you as well!!! Keep on spreading sunshine! many more congrats Tammy for winning another Award. You are so good! !